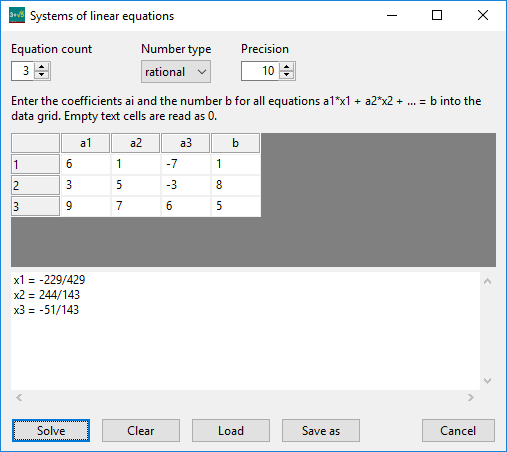 The equation solver can solve linear equation systems. The coefficients of the equations are specified within a data grid. The number of equations is selectable and corresponds to the number of solution variables x1 to xn. Systems of linear equations with up to 25 equations and variables can be solved. Using rational numbers a linear equation system can be solved exactly and without rounding errors. For linear equation systems which don't have a unique solution a parameter solution is calculated. Systems of linear equations can be loaded from CSV files and stored to CSV files. CSV files can also be processed with Microsoft Excel.